I would consider this the best potato salad ever! Cool under cold running water and drain well. In a double boiler, beat the egg yolk and vinegar until creamy, about 4 minutes. Remove from heat and while whisking, drizzle in the butter. Combine and set aside at room temperature. 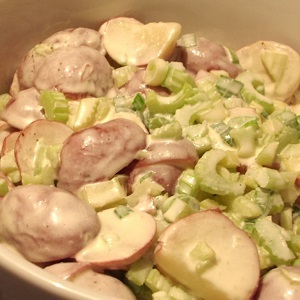 In a large bowl, combine the mayonnaise, green onions, celery, and potatoes. In another bowl, whip the cream.